A mid-air crash involving a Boeing 737 and an unknown aircraft was only avoided "at the last minute", investigators said. The near miss happened over Cambridge in July this year and has been investigated by the UK Airprox Board. Despite "extensive efforts" by investigators the second aircraft involved in the near miss has not been traced. 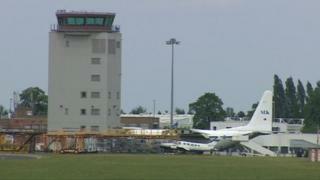 The investigation found the two aircraft had been put at risk. The report, which does not state how many passengers were on board or where the plane was heading to, told how the 737 had left Cambridge Airport and was flying at 2,500ft (762m) when the second aircraft was spotted. The two aircraft banked in opposite directions after realising they were "at the same level". The pilot of the 737 believed the risk of collision had been "high", the UK Airprox Board, which investigates near misses, found. "As it transpired, the B737 pilot saw the unknown aircraft at the last minute... and he reported carrying out a turn to avoid," the report said. Investigators said the 737 had "limited manoeuvrability" and that the pilot of the unknown aircraft had "resolved the conflict by carrying out a sharp avoiding action".